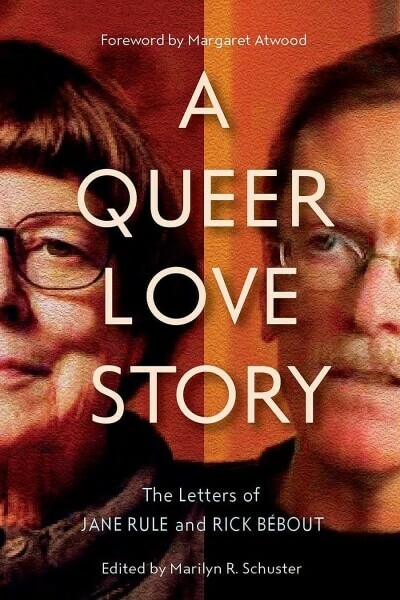 A Queer Love Story, a new release from UBC Press, chronicles 15 years of correspondence between gay novelist Jane Rule and The Body Politic editor Rick Bébout. Below is an excerpt from the book, a back-and-forth between Jane and Rick as the pair work on an essay for The Body Politic as the HIV/AIDS crisis was bubbling in Toronto. These letters provide an eye witness account of the HIV/AIDS crisis in Toronto. Beginning with a New York Times article in July, 1981 titled, “RARE CANCER SEEN IN 41 HOMOSEXUALS,” the disease was soon called GRID (gay related immune deficiency) before becoming known as HIV and AIDS. Rick mentions a “strange flu” circulating in The Body Politic (TBP) office in October 1982. When he was diagnosed in 1988 his doctor said he had probably contracted the virus at that time. Rick’s letters become a personal journal as the disease begins to affect his friends and as TBP responds to the confusion, loss and contradictory advice threatening the community. Fear caused some to see the disease as God’s punishment for deviant sexuality. If AIDS is going to be called an Act of God, I want the phrase interpreted as it is in some insurance policies. I collected 100 percent instead of the usual $50 deductible when my car was damaged by a fire in the engine. For an insurance agent, Acts of God relieve the victim of any responsibility and therefore require total compensation. For god is one of those wanton boys Shakespeare told us about who kill us for their sport. His other names are accident, disease, natural disaster, death. We live in a country which aspires to universal health care, which declares disaster areas for victims of earthquake and flood, which maintains rescue crews for people stranded in storms at sea, trapped in an aircraft, lost on a mountain. For anybody. Yet, when something terrible happens, particularly something for which we are helpless, the greatest temptation is to judge the victim. Victims, too, can seek defence against the irrational by looking for something or someone to blame, even themselves; for whatever cold comfort that is, it can seem preferable to facing the fact of random, morally purposeless disaster. . . . Illness is given moral stigma only when it is related to an activity or a group of people disapproved of. My niece has five stress fractures in one leg from playing basketball. I wouldn’t play. I wouldn’t climb a mountain either or try to cross an ocean in a small boat or do a lot of other death-defying things so much admired as human achievements, simply for their own sake. For some men the baths may be what mountains are for others, worth the risk for the view at the top, both the experience and the freedom it symbolizes as good a thing to die for, or of, as any. Many more people die of pleasure, even of the sort reserved for procreation, than is ever reported in the newspapers. Why should it be less admirable than falling in battle, where people are actually trying to kill each other? It is not the length but the quality of life that matters to me, more easily said now that I am over 50. But it has always been important to me to write one sentence at a time, to live every day as if it were my last and judge it in those terms, often badly, not because it lacked grand gesture or grand passion but because it failed in the daily virtues of self-discipline, kindness, and laughter. It is love, very ordinary human love, and not fear, which is the good teacher and the wisest judge. I have been thinking about your fondness for battle imagery, a way of keeping courage and a sense of importance, and I’m sure that’s why “dying in battle” got into the enclosed essay “An Act of God” about AIDS. I do think it bizarre that we are taught to honor those who die in battle, condemn those who die of pleasure. In the States we early memorize the last words of Nathan Hale, “I regret I have but one life to give to my country.” He didn’t give his life. He gave his death. Giving birth is giving life. There is something basically peculiar about the idea of “dying for other people.” Is there in it a male attempt to equal or transcend the power of giving birth? If only women can do it in this life, only a man can do it for the next? If dying isn’t a punishment, it certainly isn’t a virtue either. I really do want a morality focused on life rather than death. I must now get back to fiction. The material on war in your essay is very good, and, curiously, reflects a feeling I had just last night when I went to the Albany. One of the bartenders is named Carlos, a man whose intense Latin beauty could be taken to dictate that his role in clone culture would be to stand sullenly against a wall attracting lust and giving nothing in return. In fact, he’s incredibly cheery and physical, rubbing up against people and grinning as he collects empties, dancing with people he knows, taking advantage of the fact that the crowd is small enough that he can relax and actually get to know more people. There’s a big video screen at the bar, and last night they were showing the first segment of the CBC’s new series on war—tanks rumbling, marching troops, corpses—and all this accompanied by the dance floor’s disco and Carlos—rich, lush, happy Carlos in an ambulatory dance looking for ashtrays to empty. That anybody could ever see him as a “troop,” as one of that mass of expendable bodies to be thrown into these burning fields of mud and machines, that that amazing, warm, alive body could be sent off to become so much carrion—it was all too much to believe. Yet, of course, it’s not too much to believe: that’s how millions and millions of Carloses ended up. It doesn’t all quite make me a pacifist; I think there are situations in which one might have no moral choice but to fight. The horror, I think, is in the massive casualness of it all—all those hundreds of thousands of individual lives turned into faceless soldier-machines, inconvenient refugee problems and innocent civilian targets. All that gets lost except when the CBC shows scenes of war over their happy bodies on the disco floor. It was very curious.